There are many fabulous noodle dishes in Thailand that, in my opinion, put Pad Thai to shame. 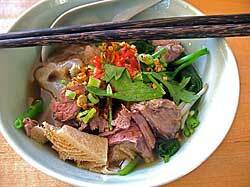 In this blog I mention just five of the fabulous variety of noodles found in the Kingdom (of Thailand). I’m picking five that I quite enjoy. I think this is probably my very favorite noodle dish. 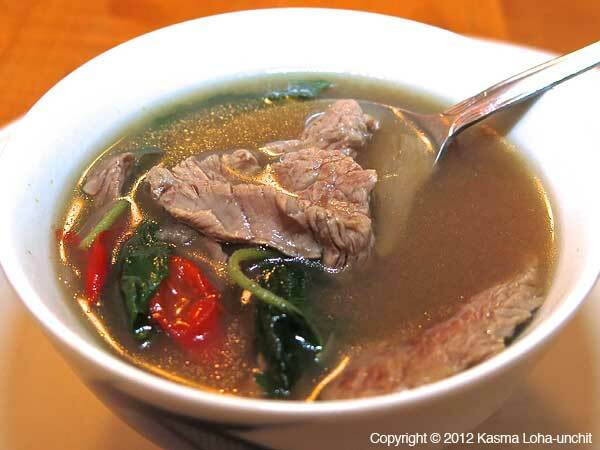 I talked about it in an earlier blog – Current Top Ten Thai Dishes. Of all the versions I’ve had, I prefer Kasma’s (pictured to the left). She makes it with delicious fresh chow fun noodles (kuay tiow sen yai, in Thai), lots of Thai chillis, holy basil, garlic and pastured pork from Riverdog farms. The result is a very spicy, tasty dish. It has to be spicy to live up to its name: the dish is called “drunkard’s noodles” (and not “drunken noodles”) because it is so spicy-hot that you need to keep drinking to cool the mouth. 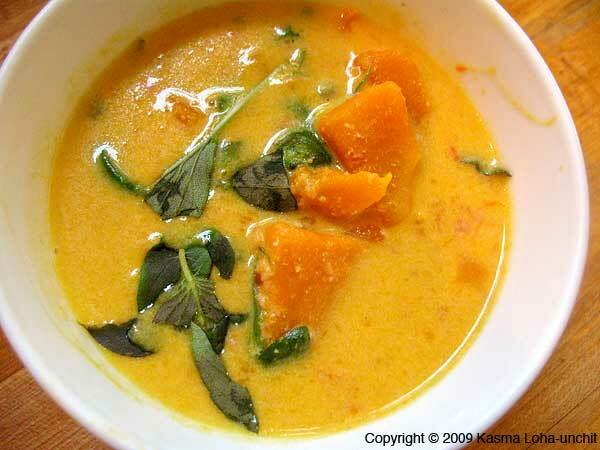 Kasma teaches this recipe in the Weekend Series Advanced Set I-4. 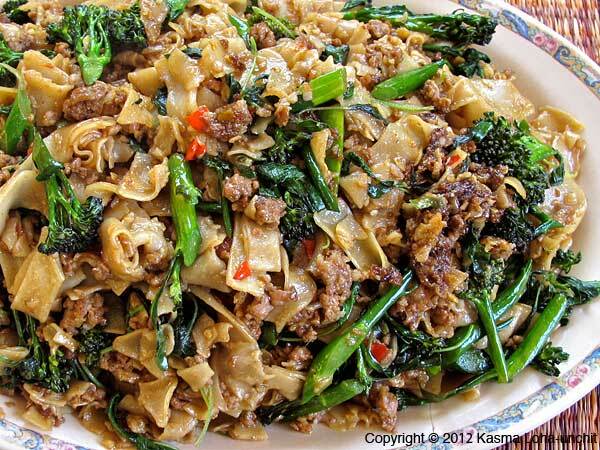 She teaches a similar dish – Drunkard’s Stir-Fried Mung Bean Sheet Noodles with Shrimp and Cuttlefish (Kuay Tiow Sianghai Pad Kee Mao) – in Advanced Set G-3. 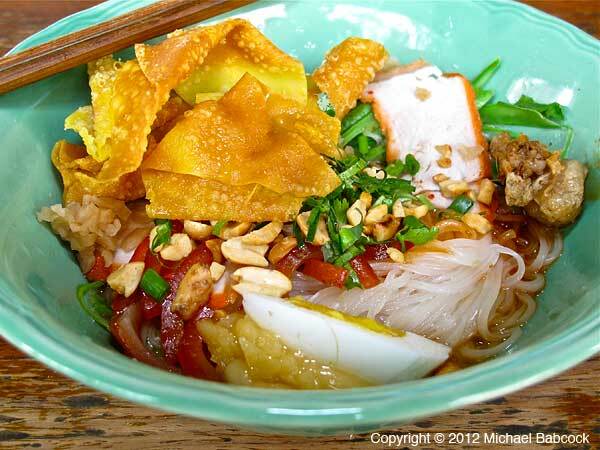 This is just a marvelous noodle dish – hot, sour and sweet. 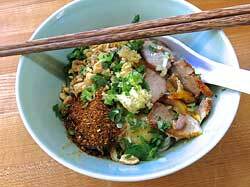 It’s full of various textures (pork cracklings, peanuts, egg, more) and flavors. It’s the only noodle dish I know that is served with a dollop of palm sugar that you mix up with the noodles. Before eating, everything is mixed together to make a tasty treat. The picture above left is from Kasma’s class where it’s a real favorite. She teaches this recipe in the Weekend Series Advanced Set F-4 and the above right picture is from a noodle shop in Sukhothai. 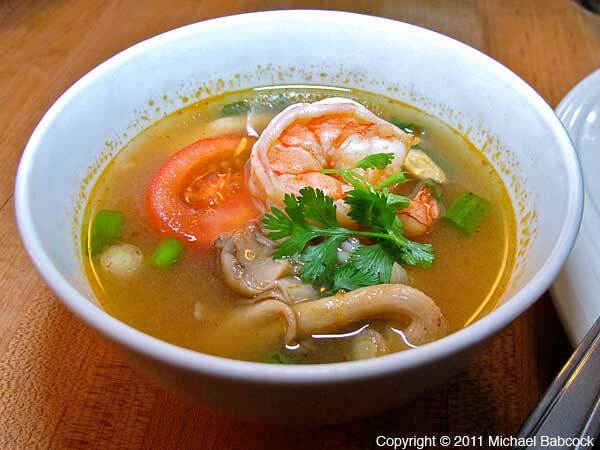 To see more pictures of this dish, check out our Facebook Album on Sukhothai-style Noodles. You may need to be logged in. This may be the noodle dish that I order the most in Thailand. The picture to the right shows a bowl from what was my favorite duck noodle shop in Thong Lo, now, unfortunately, no longer in business. 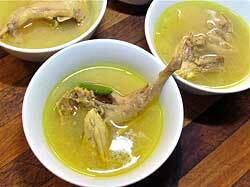 (See my blog Thong Lo Duck Noodles). It’s a simple dish: basically, roast duck, egg-noodles (ba mee) and some greens. 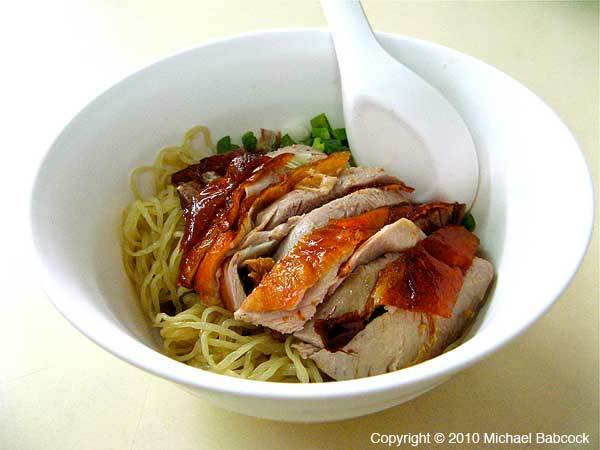 What makes it so delicious is the simplicity, the succulent roast duck (somehow so much better in Thailand), the egg noodles and the way that you spice the dish yourself. In Thailand, noodles typically are served with a Thai Condiment Set consisting of various ingredients so that you can add salty, sweet, sour and spicy, essentially creating your own favorite flavor grouping. I like these duck noodles with a sour chilli sauce for the sour, a bit of fish sauce, a generous serving of dried, roasted chilli powder and a bit of sugar to bring it all together. Delicious! No blog on delicious Thai noodle dishes would be complete without including a soup noodle, such as this one. The version pictured is from one of Kasma’s Thai cooking classes; she teaches this recipe in the Weekend Series Advanced Set C-1. I do love a good bowl of beef noodle soup with many kinds of beef: stewed beef, beef tendon, raw beef quickly cooked before serving and (often) beef dumplings or tripe. It’s stewed for many hours to make a nourishing bone broth. I prefer it with the same chow fun (kuay tiow sen yai) noodles used in the Drunkard’s Noodles above, though you can often order it with other kinds of noodles, such as thin rice noodles. It’s often served as Kasma serves it, with a hot chilli sauce made from various red peppers, garlic, lime, vinegar, fish sauce and sugar. I wanted to include khanom jeen because this possibly is the only noodle common in Thailand that does not originate with the Chinese and is indigenous to SE Asia. According to an article in the Thai magazine Krua (meaning “kitchen”) khanom jeen originated among the Mon ethnic group, who introduced them to different SE Asian cultures. The Mon called them kanawm jin. 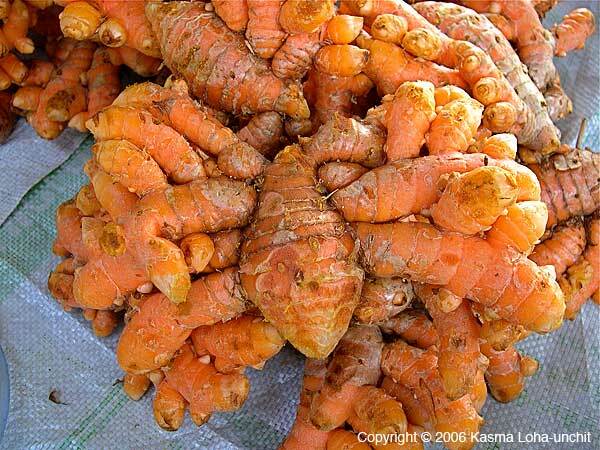 They’re known to be made and eaten in the Ayuthaya era (15th to 18th century) and it’s possible Thais have been eating them since the 8th to 11th centuries (when the Mon empire ruled much of present-day SE Asia). These noodles have a delicious, chewy texture made from older rice (rather than “new crop”). 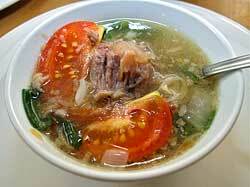 It’s a fermented noodle: the rice is soaked for many days, then kneaded by hand, pounded and then left to sit for 3 days. It’s eventually extruded into boiling water (see above right) and afterwards placed in cold water and rolled into skeins (as in the picture below right). The picture above right shows the extrusion process at a noodle shop called Ko Joi in Krabi; we’re lucky enough to eat there every time we visit Krabi. Be sure to see my next blog on Ko Joi at the start of next month. 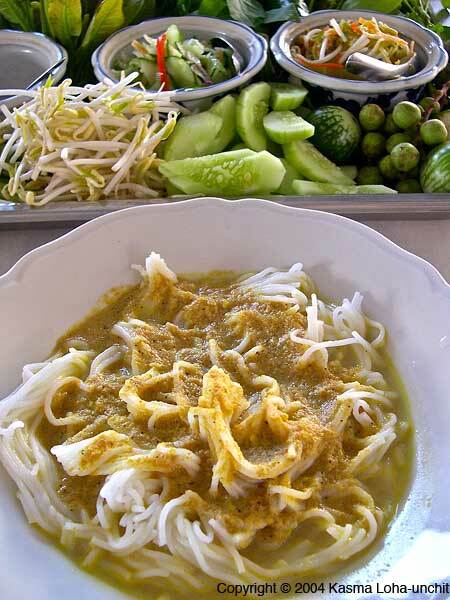 The picture above left shows Southern-Style Rice Vermicelli Topped with Spicy Fish Namya Curry Sauce (Khanom Jeen Namya Pak Tai) from Wang Derm restaurant in Nakhon Si Thammarat. It’s a dish that Kasma teaches in the Weekend Series Advanced Set E-2. 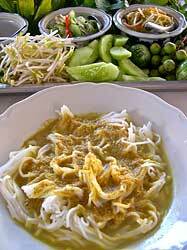 Above left is another version of Khanom Jeen Namya, the Southern-Style Rice Vermicelli with Spicy Fish Curry Sauce. This version is from Ko Joi in Krabi, where they make their own noodles. 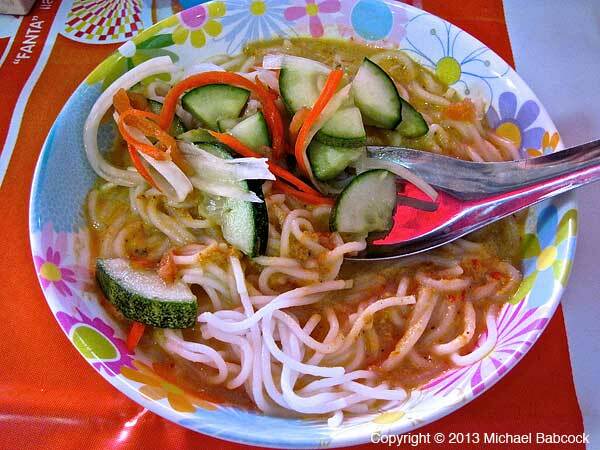 It’s been mixed together with some of the pickled cucumbers that are served with the noodles. Above Right is a typical khanom jeen stall at Khorat Market in Northeastern Thailand. Click on the picture to enlarge it and see the skeins of khanom jeen noodles. Here you choose one of the curries or sauces in the containers in front to be served over the noodles and then add in some of the vegetables in the very front row. If you want to learn to cook delicious Thai noodle dishes yourself, come take a Thai Cooking Class from Kasma. Nearly every series has at least a few noodle dishes. Don’t take my word about the number of noodle dishes in Thailand: check out my earlier blog: Thai Noodles – An Amazing Variety. 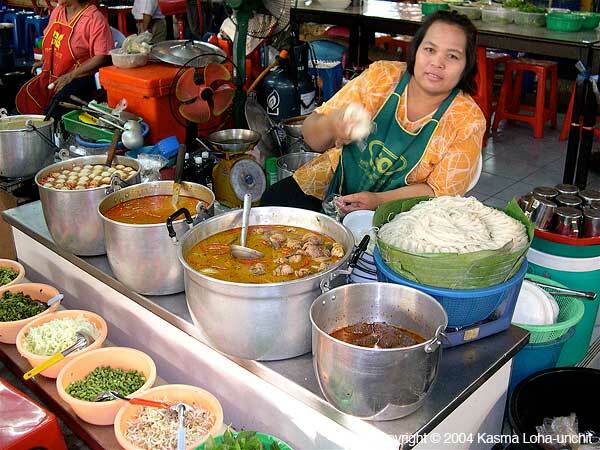 And for some perspective on Pad Thai, check out Kasma’s blog: Pad Thai: The Origin and Making of Pad Thai. 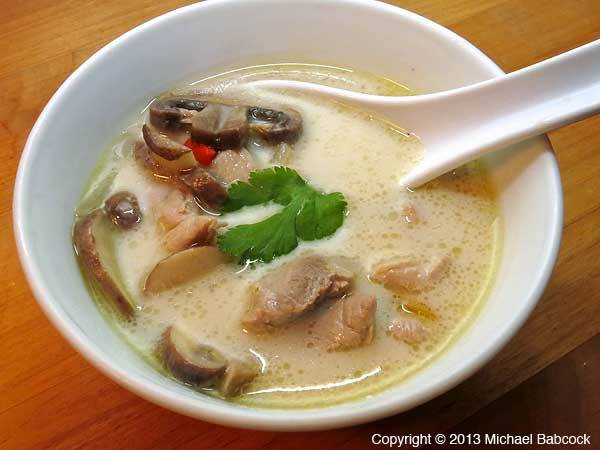 You are currently browsing the Thai Food and Travel Blog blog archives for August, 2014.